Nacházíte se: Booktook.cz → Jazyky → Angličtina → Dětská literatura → Where´s Hello Kitty? Can you find Hello Kitty? She usually stands out from the crowd, but she is lost in a crowd of copycats – and her twin sister Mimmy needs your help to find her! 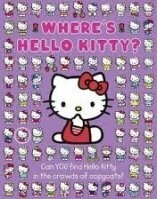 Try to find Hello Kitty in the crowds of copycats. It's more difficult than you think – and there's lots and lots happening on every page. This challenging, stylish, entertaining book will keep you entertained for hours and hours.